Post-traumatic osteoarthritis is defined as osteoarthritis that develops following a joint injury. Most of us know that osteoarthritis is the most common type of arthritis, affecting 27 million adults in the US. Osteoarthritis is also the primary cause of disability related to mobility in the US. Reportedly, 12 percent of all symptomatic osteoarthritis cases, or about 5.6 million people with lower extremity osteoarthritis in the U.S., have post-traumatic osteoarthritis. Symptomatic osteoarthritis is defined as the presence of radiographic osteoarthritis along with pain, stiffness, and some functional limitation of the affected joint. Radiographic osteoarthritis refers to osteoarthritis that is observable on x-ray, but it is not always symptomatic. There are several known risk factors associated with osteoarthritis, such as aging and obesity. 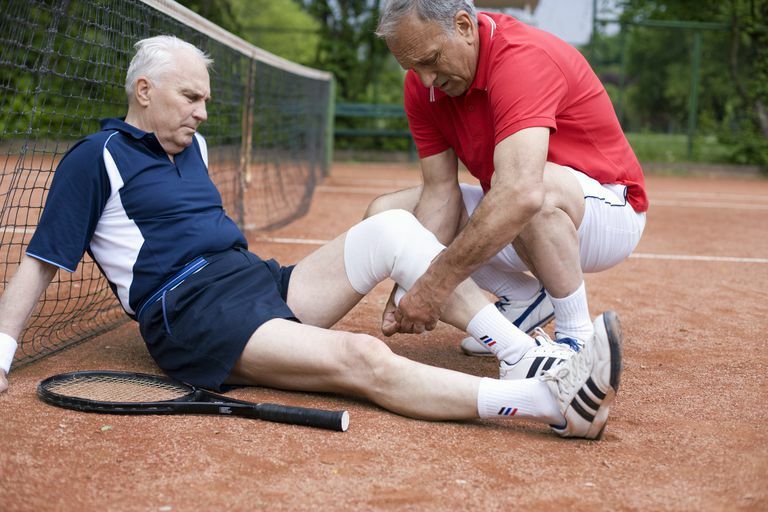 Joint injury is among the known risk factors for osteoarthritis. Joint injury can occur in any joint following trauma, but it is the knee and ankle that are recognized as most commonly involved. In the US, 11 percent of all treated musculoskeletal injuries involve sprains and strains to the knee or leg. The type of joint injury associated with post-traumatic osteoarthritis may be a fracture, cartilage damage, acute ligament sprain, or chronic ligamentous instability. It is estimated that 13 million US adults, 60 years old or older, have radiographic knee osteoarthritis. Of that group, about 4 million people have symptomatic knee osteoarthritis. Based on study results, it has been suggested that about 10 percent of all knee osteoarthritis cases are, more specifically, post-traumatic osteoarthritis. People who injure their knee are 4.2 times more likely to develop osteoarthritis than people without the knee injury. Ankle osteoarthritis is much rarer. According to the Journal of Athletic Training, only one percent of the world's population has ankle osteoarthritis related to any cause. People are 10 times more likely to be diagnosed with knee osteoarthritis than ankle osteoarthritis. Joint injury or trauma is clearly the primary cause of ankle osteoarthritis, with 20 percent to 78 percent of all ankle osteoarthritis cases specifically linked to post-traumatic osteoarthritis. Post-traumatic hip osteoarthritis accounts for just 2 percent of all hip osteoarthritis cases. However, the prevalence of post-traumatic hip osteoarthritis is considerably higher among the military, perhaps as high as 20 percent. The prevalence of post-traumatic shoulder osteoarthritis is estimated to range from 8 percent to 20 percent among people who are scheduled to have surgery for anterior glenohumeral instability. The knee is involved in 15 percent of all high school sports injuries. About 250,000 anterior cruciate ligament (ACL) injuries occur each year in the US. Of the 250,000 with ACL injuries, 175,000 have surgery for ACL reconstruction. About 75 percent of ACL injury cases also have damage to the meniscus. Both ACL and meniscal injuries are considered to be high risk for post-traumatic osteoarthritis. Interestingly, a systematic review revealed that the prevalence of post-traumatic osteoarthritis was higher among those who had reconstruction surgery for their damaged ACL compared to those who did not undergo reconstruction. "Time since injury" was a factor, though. It was determined that in the 20 years after injury, people having reconstruction had a higher prevalence of post-traumatic osteoarthritis than those who did not, as stated above—but, in the third decade (i.e., 20 to 30 years after injury), the people who did not undergo ACL reconstruction had a 34 percent greater prevalence of post-traumatic osteoarthritis than those who underwent reconstruction. While meniscal injuries and surgeries are also linked to post-traumatic osteoarthritis, at the 2-year mark (post-injury), there does not appear to be a significant association. Complete meniscal resection does seem to be more associated with the development of post-traumatic osteoarthritis than either meniscal repair or partial meniscectomy. What specifically causes post-traumatic osteoarthritis after ACL or meniscal injury is not fully understood. Contributing factors likely include increased inflammatory markers, tissue damage from an injury that jumpstarts the degenerative process, cartilage degradation, and altered joint loading or other biomechanical changes in both injured and reconstructed patients. Another significant factor may be the quadriceps muscle weakness that occurs following a knee injury. That, too, can affect joint loading, and abnormal loading can impact cartilage. Ankle injuries are the cause of 20 percent of emergency room visits. The ankle is involved in 23 percent of high school sports injuries. Most ankle injuries are due to lateral ankle sprains. It is estimated that 25,000 ankle sprains occur each day in the U.S. Despite the number of sprains, 37 percent of post-traumatic ankle osteoarthritis cases are the consequence of fractures. The course of treatment for post-traumatic osteoarthritis generally follows that of osteoarthritis. There are non-surgical treatment options, including weight loss, lateral wedge insoles, braces/supports, and exercise. There are medications, primarily analgesics and nonsteroidal anti-inflammatory drugs (NSAIDs), as well as injections of either hyaluronic acid or corticosteroids. Joint replacement surgery is another treatment option, but the age of the patient must be considered. Surgery is less optimal for younger patients since they may outlive their prosthesis, requiring one or more surgical revisions along the way. Injury alone may not cause post-traumatic osteoarthritis to develop in an affected joint. In fact, there may be genetic factors involved. Genetic factors that are recognized as contributing to osteoarthritis may also contribute to post-traumatic osteoarthritis. It's a complicated process, but we know that joint injury does trigger a chronic remodeling process in cartilage and other joint tissues. The changes in the joint that result from the remodeling process may lead to post-traumatic osteoarthritis, especially in people genetically predisposed to it. The time it takes to get from joint injury to post-traumatic osteoarthritis can be less than a year in people with severe fracture or as long as a decade, if not more, in people with ligamentous or meniscal injuries. Also, older people (i.e., over 50 years old) with fracture are more likely to develop osteoarthritis than those who are younger. Lotz, MK. New developments in osteoarthritis: Posttraumatic osteoarthritis: pathogenesis and pharmacological treatment options. Arthritis Research and Therapy. June 28, 2010. Schumacher Jr, HR, et al. Chapter 13 - Secondary Osteoarthritis. Osteoarthritis Following Joint Injury (Post-Traumatic Osteoarthritis). Osteoarthritis: Diagnosis and Medical/Surgical Management. Fourth edition. Lippincott Williams & Wilkins. Stiebel, M et al. Post-traumatic knee osteoarthritis in the young patient: therapeutic dilemmas and emerging technologies. Open Access Journal of Sports Medicine. 2014; 5: 73-79. Thomas, AC, et al. Epidemiology of Posttraumatic Osteoarthritis. Journal of Athletic Training. Volume 51. No. 5. May 2016.